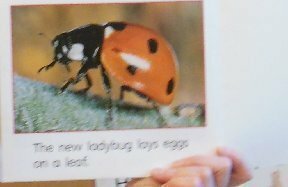 This week in Science, we learned about the life cycle of a ladybug. 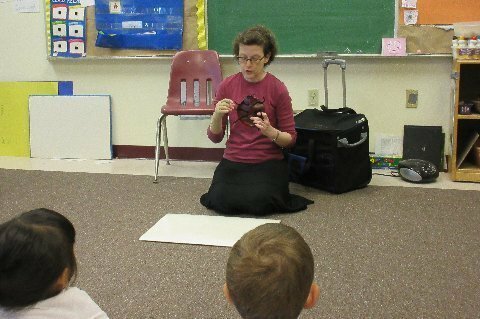 First, we looked at a giant ladybug and discussed what we already knew about them. It has two eyes, two antennas, and six legs (as do all insects). 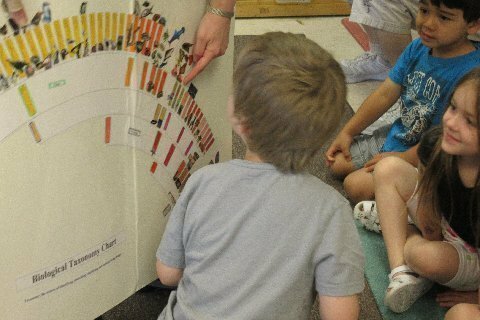 We talked about what other kinds of creatures the ladybug might be related to – and found them on our taxonomy chart. 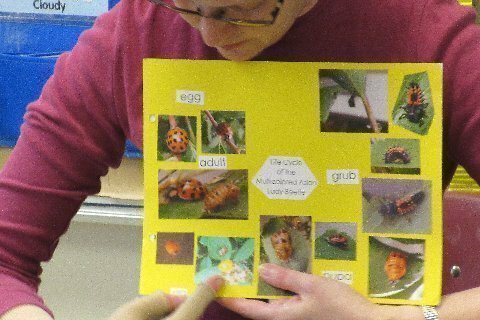 This book showed us photographs of the life cycle of a ladybug. Larva (grub) –> They don’t look anything like ladybugs!!! Eggs…and around we go again. We also looked at a poster-in-progress of the life cycle of a ladybug. 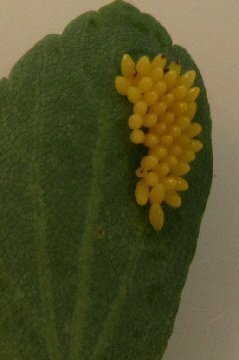 I noted that, while I’ve been working on the poster for several years (using photos I’ve taken in my yard), I’ve never been able to find ladybug eggs. I’ll just keep looking and will leave a space on the page for the eggs. and some were black with yellow spots. 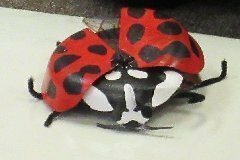 Next, we got to see the real creatures up close – I found Multicolored Asian Lady Beetles in various stages of maturity in my yard a few days ago. There were ladybug grubs which we moved to smaller fog-free containers so that we could see them clearly. There was a jar containing adult ladybugs and there were also twenty small containers containing old pupa molts. Once the ladybugs are fully developed, they crawl out and leave the molts behind (for science teachers to collect and put in containers). 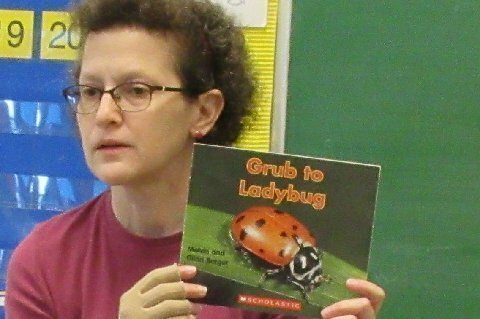 Ladybugs and ladybug grubs can bite, though the bite doesn’t usually cause a reaction in people. Because of this and the facts that mature ladybugs fly and the grubs can run pretty fast, we left all of them in closed containers just to be safe. We spent some time studying all of the creatures. We thought that was the end of class. 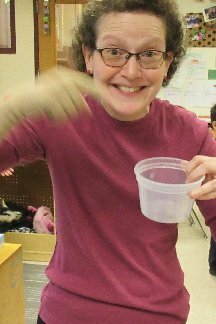 However, in my next class, several children discovered ladybug eggs in the jar with the adult ladybugs. I was a little bit excited. I came back to Room 201 to show everyone the eggs. They looked just like the ones in the book. Amazing! Now I can finish my poster.